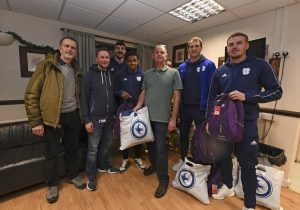 Cardiff City players Callum Paterson, Kadeem Harris, Alex Smithies and Danny Ward took time away from the club to pay a visit this week to the Sir Julian Hodge Hostel, which is run by homeless people charity, The Wallich in Roath, Cardiff. They took along gifts of waterproof coats, fleeces and backpacks. Pictured with the players is far left Cardiff City Supporters’ Trust vice chair David Craig, Ben Ramsay, Project Co-ordinator for Cardiff Solutions and Rob Minchin, Project Manager, Sir Julian Hodge Hostel (right). Before Saturday’s Manchester United game, the Trust’s supported charity, The Wallich, will hold a bucket collection in aid of its vital work with homeless people. Cardiff City Football Club is fully supporting the collection. Many fans will be well aware of the growing number of people living on the streets of our cities and towns in recent years. Some sadly have passed away. In the 21st century, no one should be dying on our streets. Cardiff City fans have always been very generous and we hope they will give as much as they can to this worthwhile collection. Money raised will help fund The Wallich’s Cardiff Nightshelter, which provides safety, warmth and comfort to 23 people each night, who would otherwise be forced to sleep rough. The Wallich, which started its work 40 years ago in Cardiff, is now giving help and advice to homeless and vulnerable people through 65 projects across Wales. Recent home victories have been celebrated at the end of the game by a light show emanating from the stadium floodlights mounted on the stands. One of our Trust members raised the issue of the potential impact of the display on him, and others like him, as a light sensitive epilepsy sufferer, so we discussed the matter with the club, whose prompt and helpful reply can be summarised as follows. When the lighting system was being designed for installation, the club had an expert`s report commissioned to ensure that the lights would not cause such a problem. The report, written by a FIFA,UEFA and Premier League approved expert, concluded that the frequency of the flashing lights being used by the club would not have a stroboscopic effect which might lead to problems with epilepsy. In addition, as a “failsafe”, the club has positioned warning notices at turnstiles and in concourses stating that flashing images and lights might be used in the stadium. We have asked the club to also ensure that prominent messages are also relayed via the stadium big screens by way of similar notification. The club will be paying a £600.00 subsidy for each coach travelling to Watford. On behalf of the Foxes Trust and, more widely, of the whole Leicester City family, I would like to thank you for the support given to our club and our fans during the match at your stadium on Saturday, 3 November 2018. It has been well-documented what an unusual, indeed unprecedented, occasion the match was likely to be. In the event, it was completed with great dignity, great solemnity and a true feeling of togetherness from the whole footballing community. The people of Cardiff were magnificent to our travelling fans – yes, even those people whose main focus for the day was on certain rugby international. The provision of free food for our fans was a wonderful touch by Cardiff City. The pre-match ceremonies, including the exchange of flags, was done with great dignity. The players of both teams can hold their heads high that, despite the circumstances, they produced a properly competitive game of football. The scene at the end of the match, when Leicester City’s squad and staff came to be with the travelling fans was unlike anything any of us have witnessed before. For those Leicester fans who were at the game, it will be one they never forget. That 15-minutes will mean that for 3,000 Leicester fans, Cardiff, Cardiff City Football Club and the Cardiff City Stadium will always have a special place in our memories and our hearts. We will also be sending a letter directly to Cardiff City Football Club, expressing the same sentiments. Cardiff fans and on the day had created a memorable banner, which now has a prominent position in the place of remembrance for Khun Vichai at the King Power Stadium. It simply states, “Blue together”. Cardiff City Football Club has kindly agreed to allow the Trust supported charity, The Wallich, to hold a bucket collection in aid of its vital work with homeless people across Wales.he bucket collection will take place before the headline match against Manchester United on Saturday, December 22nd. Trust chairman, Keith Morgan, said: “We are thrilled at this generous gesture by the club and wish to thank chief executive, Ken Choo, for agreeing to the collection. “The fact that the collection will be on the Saturday before Christmas is poignant because it is at this time of the year, probably more than any other, that the vulnerability of the less fortunate members of society comes into sharp focus. “The Wallich, which started its work 40 years ago in Cardiff, is now giving help and advice to homeless and vulnerable people through 65 projects across Wales. The Trust has chosen The Wallich as its charity for the current season. Michael Cowley, fundraising and partnerships senior manager for The Wallich said: “We are really grateful to the Cardiff City Supporters’ Trust and the club for their support and the opportunity to promote the work of The Wallich at such a high-profile fixture. “The money raised will help fund our Cardiff Nightshelter which offers safety, warmth and comfort to 23 people each night who would otherwise be forced to sleep rough. Cardiff City Executive Director & CEO, Ken Choo, said: “Cardiff City FC is very pleased to be supporting the Supporters’ Trust’s chosen charity, The Wallich, again this winter. Cardiff City Supporters’ Trust is delighted to announce that it has made a £3,000 donation to the work of the Cardiff City Foundation. The Foundation is an independent charity set up by Cardiff City Football Club to help young people in the community offer opportunities for education, training and work, in addition, to encouraging a healthier lifestyle through sport. Trust chair Keith Morgan said: “We are very pleased to support the valuable work of the foundation across south Wales and feel it is crucial that we also make a contribution to local society.